(Bloomberg) -- California Governor Gavin Newsom proposed a "digital dividend" that would let consumers share in the billions of dollars made by technology companies in the most-populous U.S. state. In his "State of the State" speech on Tuesday, Newsom said California is proud to be home to tech firms. But he said companies that make billions of dollars "collecting, curating and monetizing our personal data have a duty to protect it. Consumers have a right to know and control how their data is being used." He went further by suggesting these companies share some of those profits. 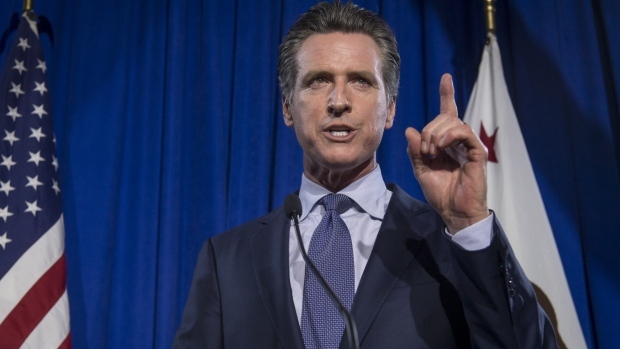 "California’s consumers should also be able to share in the wealth that is created from their data," Newsom said. "And so I’ve asked my team to develop a proposal for a new Data Dividend for Californians, because we recognize that data has value and it belongs to you." Newsom didn’t describe what form this dividend might take, although he said "we can do something bold in this space." He also praised a tough California data-privacy law that will kick in next year. Alphabet shares gave up some gains in New York trading, while Facebook turned negative, following Newsom’s comments.